The Whiskey Authority—In More Ways Than One. I first met Paul Pacult in the early 90s when I was running marketing for Seagram Americas. He and Gary Regan invited me on their radio show to discuss Single Malts and The Glenlivet. Over the years I’ve come to admire his passion for the spirits and wine industries. I consider him to be among the top experts in the business. 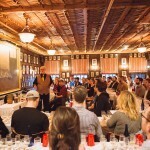 Consequently it’s not a surprise that I jumped at the opportunity to attend his first The Whiskey Authority (TWA) session in New York. Before I go into that, for those of you who don’t know him or of him, here’s a brief background. 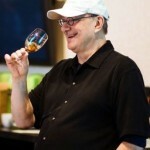 In a 2006 article, Forbes described him as “America’s foremost spirits authority.” His F. Paul Pacult’s Spirit Journal (which I read avidly) is considered a top notch and independent source of reviews and ratings. He has also been a journalist writing for such publications as The New York Times and scores of magazines. What I find most interesting is his consulting and educational training practice. In fact, when I was managing the introduction of a Mongolian vodka a few years ago, I turned to Paul for an evaluation of the brand’s taste profile and its strengths and weaknesses versus competition. What I learned was extremely helpful. 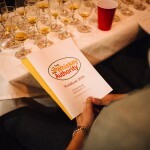 A number of years ago, Paul launched The Rum Authority, described as “a series of seminars dedicated to demonstrating Rum’s universal appeal to both the novice and expert alike.” Which brings me to his newest endeavor, The Whiskey Authority (TWA). The inaugural session I attended was fascinating and well worthwhile. Here I am with none-of-your-business number of years in the industry, worked for the biggest and best (as an employee or consultant), and “been there and done that” knowledge and understanding of booze. Well, I’m not embarrassed to tell you that I learned a great deal in the few hours I spent at the seminar. First and foremost, Paul is an outstanding speaker/lecturer and very entertaining as he educates his audience about a serious and often confusing subject. The audience at the seminar is primarily bartenders (the critical consumer influencer these days) with a smattering of distributor sales reps and (ahem) one or two bloggers. The session begins with a fun-filled and informative talk about whiskey including the critical elements and their role, all laced with amusing and engaging stories based on Paul’s 30+ years in the industry. Each of the products presented were first given the “nose test” then two blind taste tests. It was particularly fun to try and guess which brand was being tasted, before Paul revealed the brand. Brand members support TWA and there were 12 brands to taste. Sue Woodley, Paul’s wife/partner, told me they had more than 15 wanting to participate but they felt that was too many for one session. I also asked Paul about the sponsors and why they participate. His answers were not surprising. TWA provides an opportunity for brand’s to have their story told to leading bartenders in important markets; to have their brand blind taste tested on “a level playing field” to highlight their virtues in a friendly environment; and, to be part of a program that’s purely educational. I think it’s more than that. It’s all about Paul Pacult, an acknowledged and unbiased expert, who gives the presentation greater seriousness and credibility. 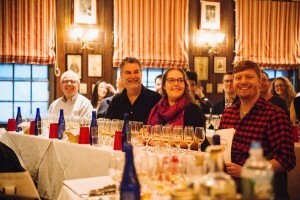 The brands that participated included Chivas, Michter’s, Highspire, Aberlour, Johnnie Walker, Redbreast (the one I fell in love with), among others. In addition to the session in NYC, there was one in DC and one coming up on June 20th in San Francisco. Three more are in the planning stage for this year. But, they are by invitation only. As far as I’m concerned, this is a showcase and opportunity that should not be missed by either large or small brands. Hey Paul, where were you when I needed you? I would have had as many Seagram brands as you could accommodate at your sessions.